Are they pinto beans, black eyed peas, navy beans, black beans or white beans.? No! What about adzuki beans, green beans, string beans, or kidney beans? No! After about a half hour of head scratching I declared them magic beans. I decided we should plant them outside so that in the morning, we could climb up a beanstalk and visit the giants. Just kidding. The solution to our quandry was really easy. 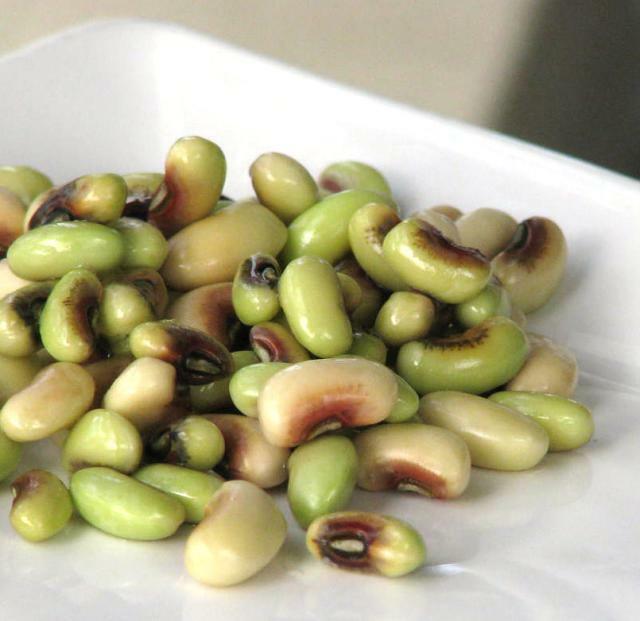 I went to the handy dandy Greenling website and browsed the pictures of their available local produce and identified the magic beans as: Purple Hull Peas!! I am still not sure how we’re going to cook these lil’ puppies, but there are tons of delish recipes online. Besides the magic beans things are going great. We have plowed through about 20% of our goodies already, and cooking all the produce is not more work than any other kind of cooking. If anything it is less work than cooking with other produce. The quality of these ingredients- particularly the fresh basil, tomatoes, and peaches- is so high that they require very little prep or other ingredients to taste good. It also helps that Rami is a dishwashing whiz!! More soon, including an update about what the heck we’re going to cook with the purple hull peas. This entry was posted in Vegetables and tagged Pea. Bookmark the permalink.